Sounds creepy! Now it is on my wish list. That is a great cover and a special cat?? That's awesome! Oh it sounds pretty cool! Sounds absolutely great..I'm off to list it for a must-read this year!! Thanks so much!!!! It does sound good! It's a long ways away, but I look forward to reading it when I can. Nice pick! This looks awesome. I'll have to get this one when it comes out. Great pick! I'll put it on my wishlist. The cover is pretty creepy too. Oooh...this one sounds good. Thanks for bringing it to my attention! Sounds deliciously creepy! Japanese ghost stories always frighten me the most. Look at all of the comments - WOW! 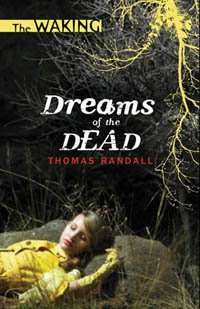 Thank you so very much for bringing the book Dreams of the Dead to everyone's attention. Not only is the book fantastically creepy, but it's the first in a series! We'll have more information about The Waking at the website - http://www.thomasrandall.net - in the near future. Hi, I have awarded you the Proximidade award. Stop by and pick up the logo,etc. This sounds interesting. I like the cover. This does sound really good Lenore. I like the cover too. This does look good, and you are right, if Little Willow says its good, I believe it! Very creepy! I love mysteries. Especially ones that take place at schools...I don't know why. The cover for this on amazon is a different one that looks like a manga. Good thing they changed it. I am such a cover snob! Sounds great--I'll have to add it to my reading pile! I also wanted to let you know that I've nominated your blog for an award here. wow, creepy cover. It sounds like it matches the book. Glad they changed the cover. I don't mind manga covers but they should be on manga. We added the summary and a fantastic quote from Amelia Atwater-Rhodes to thomasrandall.net - Do you want me to let you know when the site is fully open with more content? I'd be happy to! Email me or drop me a blog comment!